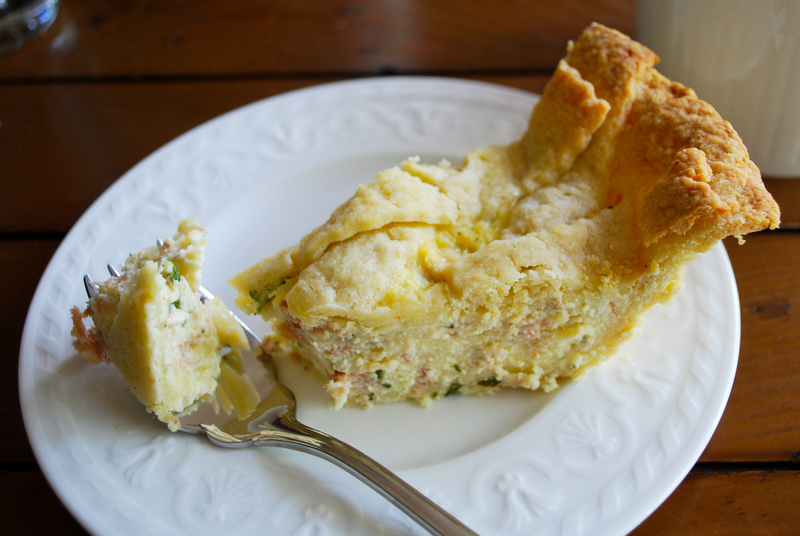 Pizza Rustica, this week’s Tuesdays with Dorie/Baking with Julia recipe, is not exactly what most people think of when they hear the word pizza. This is actually a traditional Italian dish translated as “rustic pie” that is made with a sweet pie crust and a cheesy, meaty, egg based filling. It is usually eaten at room temperature or even cold, and often as an appetizer according to Nick Malgieri, the contributor of the recipe. The Italian version of quiche maybe? The major difference is in the crust. It is a basic Italian pastry dough called pasta frolla which is used in most of their pie recipes, either sweet or savory. It is made with a good amount of sugar added to the flour with eggs to bind it together. The recipe did not call for chilling the dough or pre-baking it, but it rolled out without problem and baked up just perfectly. In the filling you will find ricotta cheese, eggs, mozzarella cheese and Pecorino Romano, along with prosciutto and parsley. 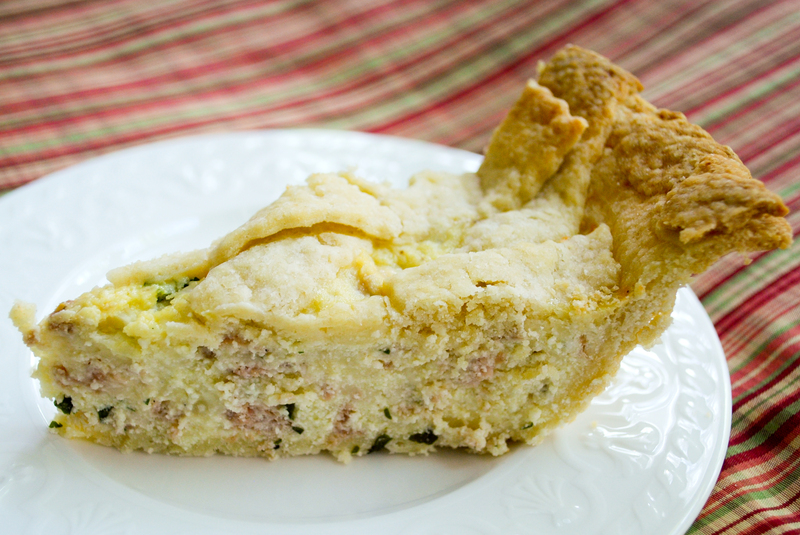 This savory filling, especially with the salty Romano cheese and prosciutto, is used to provide a pleasing contrast to the sweet crust. I thought it was an interesting combination but I did feel like the filling lacked a little “oomph” which might possibly be cured by adding more of the Romano cheese, another salty meat, or a few more seasonings. We had a slice warm with our dinner the night is was made, then I tried a bite once it was completely cool, and then had a cold slice for breakfast the next day and I liked it equally well at all temperatures! This was a really fun recipe to make and not extremely complicated either. I’m sure the other TwD’ers will provide a ton of ideas for additions and variations of it too. If you’d like to try this one out, visit our lovely hostesses for the week, Emily of Capitol Region Dining and Raelynn of The Place They Call Home where you will find this recipe! Ever since my daughter could express herself, she has been an animal lover. She used to stop people walking by our house with their dogs and ask if she could pet them. Her book choices at the library always include at least one animal book. Horses, whales, hedgehogs, naked mole rats – you name it, she wants it as a pet. But she can’t stand monkeys. I don’t even know when her dislike for monkeys started, but the first time we went to the zoo she told me in no uncertain terms that she did not want to see the monkeys. “You know I hate monkeys, Mommy,” she said. I do?? Monkeys have been very popular on kid’s clothes lately, and she was completely freaked out by this. At her school one of the third grade teachers had decorated her room with all kinds of fun monkey stuff. It would have been very traumatic if she had turned out to be my daughter’s teacher.